Like crab cakes but with chicken! Like crab cakes but with chicken! Mix the ingredients together in a bowl until the mixture comes together enough to form cakes (add bread crumbs if too wet, mayo if too dry). In a non-stick skillet use cooking spray generously (butter flavor preferably - or use butter and some light oil), cook on high until the first side is golden brown, flip the cakes, turn the heat down a bit, and place the lid on top (but do NOT seal, it's just keep some of the heat in without burning it. 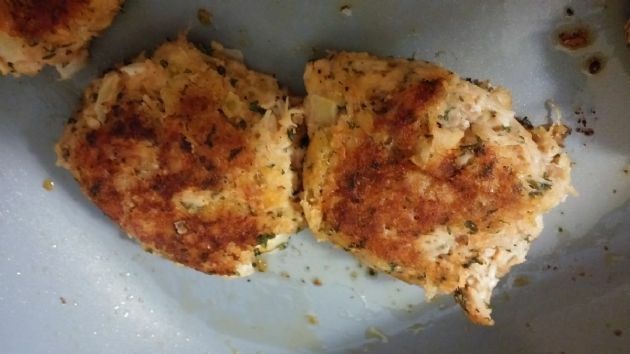 Recipe submitted by SparkPeople user BIGCURVYGIRL. by: GAMECOX I love to cook, and try new recipes. I also collect cookbooks, so this is my Electronic version!